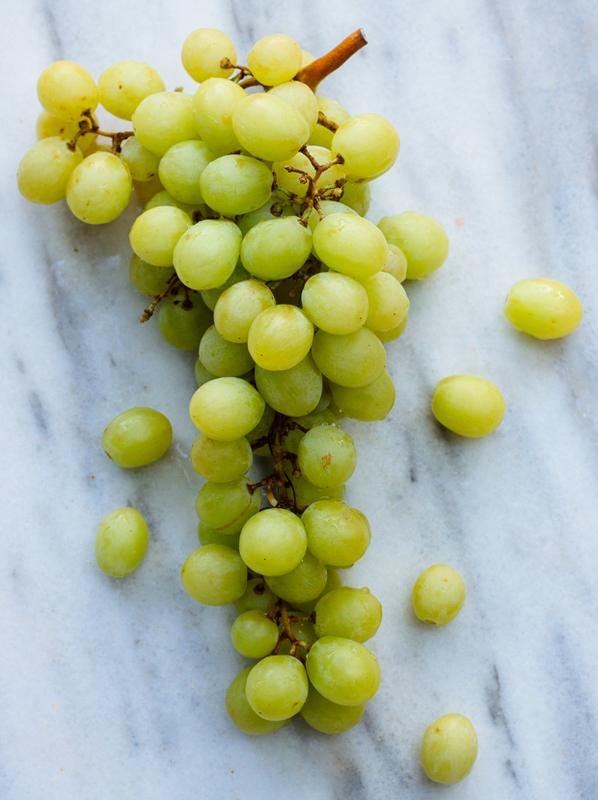 This week is (almost) all about grapes. The star fruits of the summer are usually watermelon and melon, are they not? They are juicy, sweet and absolutely irresistible with their gorgeous colours and lovely flesh. I get it, I really do, you can’t say no to them, you can’t really have summer without them. But let’s go back to grapes: so many varieties, each in a beautiful, unique shade and that taste! sweet and tart, bursting in your mouth one berry at a time. Melons and watermelons also make me starstruck, but my true soft spot is reserved all year round for grapes. And it didn’t happen overnight- see, half of the property around our summer house is covered with vines; most of our shade is provided by grapevines, tall and short ones, of different varieties, some filled with fruit most of which is sadly not incredible tasty. Still, my parents have not only carefully and lovingly been caring for these vines since they planted them, my dad’s also tried to make wine out of them a number of times. He turned the house’s basement into a cellar, bought tons of bottles, a bottle-sealing stand, labels and other relevant (irrelevant) paraphernalia. He was trying for a couple of years (although in all honesty, most of his efforts were spent in harassing people about the wine, instead of actually trying to make it) and at times we had some pretty decent wine. Most of the time though, we had great vinegar- get it? Since I’m not involved in the wine (or vinegar) making business, my love for grapes is expressed in the kitchen. I’ll have them raw at any time of the day, but I also find them to be the perfect company for cheese and cold meats. 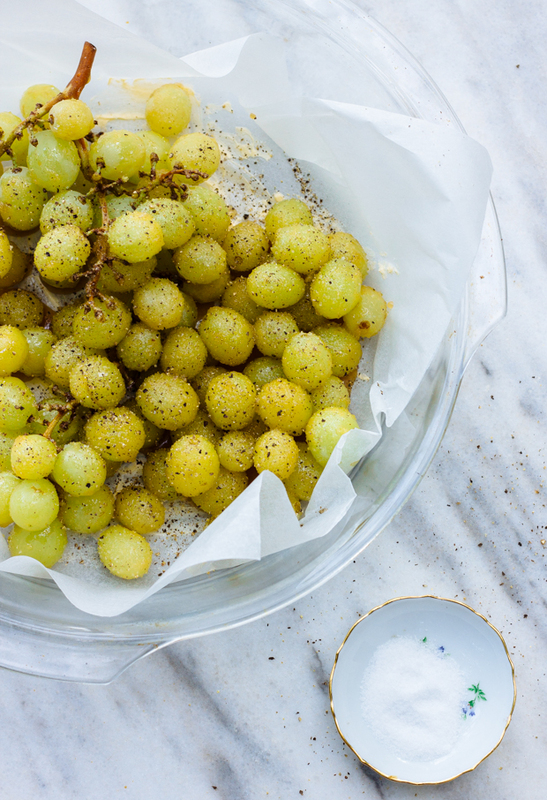 Last time I was preparing a platter to be had with some cold (store bought, of course) white wine, I tossed fresh, juicy grapes with some sweet and fragrant honey, topped them with sea salt and freshly ground pepper and roasted them until soft. 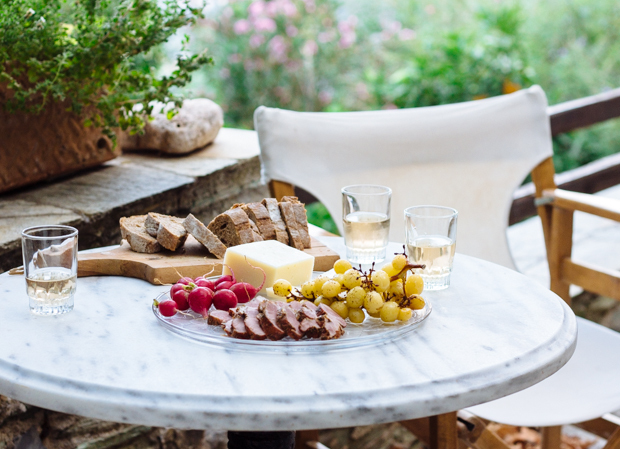 So easy, so simple, so sweet and just perfect for a summer quick bite! Preheat the oven to 200C (180 for air), line a baking dish with parchment paper and spread the soft butter at the bottom. 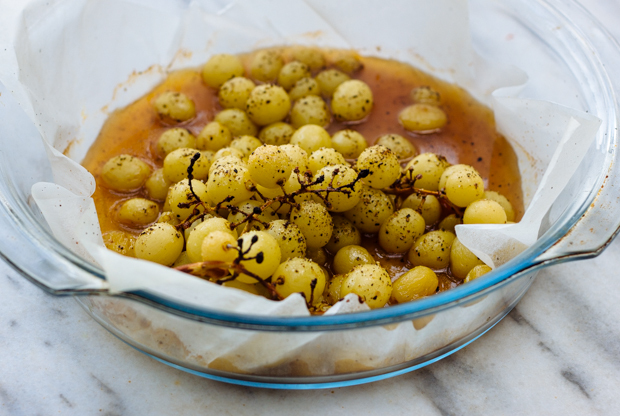 Place the grapes on the dish and coat them well with the honey (use your hands). Season with salt and add black pepper to taste. Roast for about 20′, or until the grapes are soft and the liquid underneath them starts to slightly thicken. 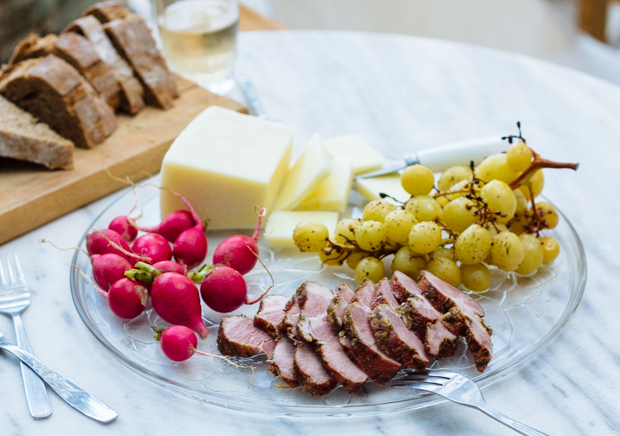 Remove from the oven, let cool slightly and serve the grapes with cheese and cold meats. Reserve the juices (and some of the grapes too) and add to green salads or use as ice-cream or yogurt topping. So happy you like it, thanks for stopping by!